This past May, Meraki hit a major milestone: 1 million networks. One of the most gratifying parts of this growth has been seeing the emergence of a passionate group of Meraki users. We see you at conferences, in training sessions, on webinars, and on social media. Until now, though, there hasn’t been a great place for you all to connect with each other. 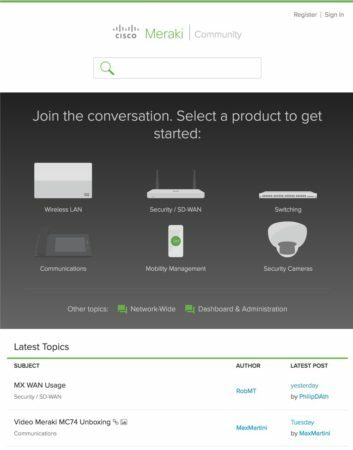 That’s why we’re excited to announce the Meraki Community, our new forum for discussing all things Meraki. Perhaps you want to discuss how best to configure APs as a mesh in a 50,000 square-foot warehouse? Share notes on the vMX100? Or just spread the Meraki love by posting a picture of your favorite swag? You can do all this and more in the new community. Would this router setup work? Share how you are using Meraki gear in your environment and find tips from other users who have had similar experiences. Can’t find what you’re looking for? Start a new topic. There are many Meraki experts on the community who are eager to help out. 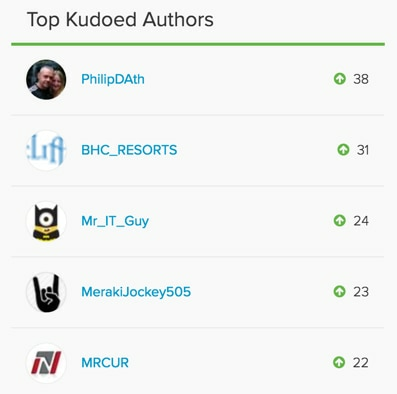 Join PhilipDAth and BHC_RESORTS at the top of the leaderboards! We’ll be recognizing top users (and just maybe awarding some swag) each month.